IBM Cognos Analytics represents the next phase in the evolution of business intelligence by re-framing what's possible. See how we bring Business Analytics and Data Science together to help companies achieve their analytics objectives. See how IBM Cognos Analytics fits with the rest of IBM's portfolio to help you accomplish your analytics objectives. 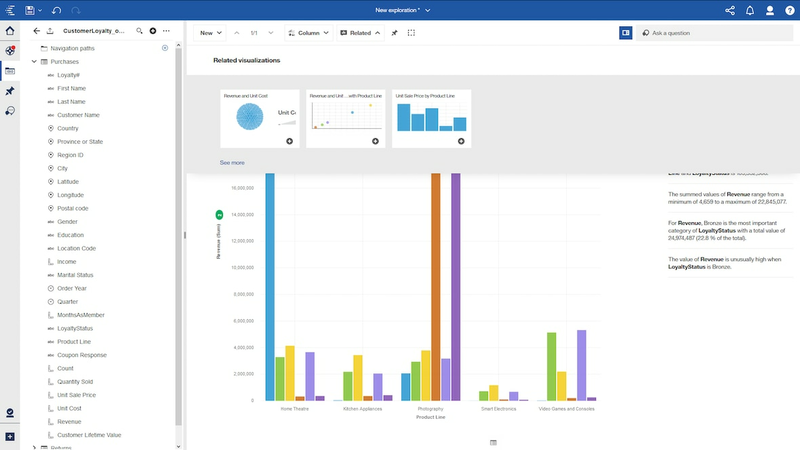 See how you can take advantage of Cognos Analytics on Cloud. To harness the value of big data, a new BI solution is required. Learn more from Frost & Sullivan. Cognos Analytics helped WestJet overhaul its operations and make analytics accessible to its business users. With Cognos Analytics, GameStop is creating a culture of self-service insight for their business and their partners. Cognos Analytics is helping Elkjøp Nordic boost retail performance with second-by-second sales analytics. See how you can move forward into the future by upgrading from Cognos BI to Cognos Analytics.